When her mother gets a new job as a housekeeper for a woman who doesn't like children, Turtle must move to Key West to live with her aunt and uncle while her mother waits for her dreamer of a boyfriend to pop the question so they can finally be a family. In the meantime, Turtle adjusts to life with her relatives in Key West which includes a band of raucous boy cousins who call themselves The Diaper Gang (because they, ironically, know how to soothe fussy babies) and the surly grandmother who had a falling out with her mother. As Turtle gets to know the family she's never met, she comes to grow an affection for them - even her cousin Beans who does not appreciate having to give up his room for this surprise familial intruder. While Turtle in Paradise is not a book with an exciting story arc and/or lots of edge-of-your-seat drama, there is a quiet beauty to it. It's one of those books where you just want to sit down on the porch swing with a glass of lemonade and visit with the characters for a while - and it is an additional reminder as to why I will forever prefer character-driven novels to plot-driven ones. 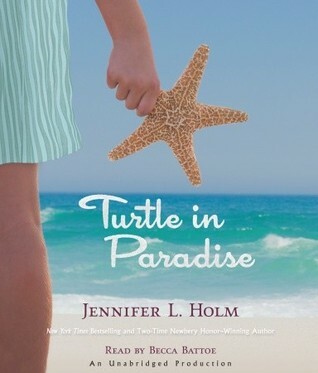 In Turtle in Paradise, Jennifer Holm weaves family stories into something magical. I highly recommend reading the author's note at the end. It's a great way to show students and aspiring writers alike how to take inspiration from all around you. I finished the audiobook of Turtle in Paradise in less than 24 hours while I was recovering from LASIK surgery thanks in part to the soothing voice of the narrator, Becca Battoe. It's one of those audiobooks that makes you enjoy the listening experience just as much, if not more so than than the reading experience.